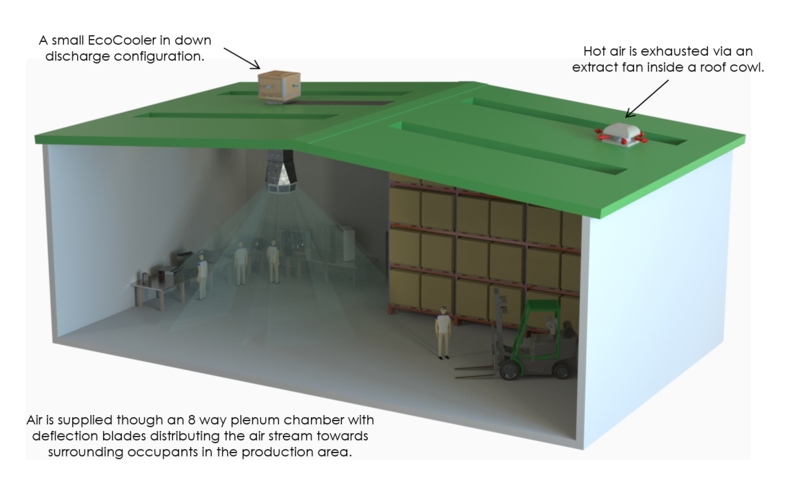 Many warehouses are now suffering the effects of heat, particularly in areas where mezzanine floors have been built or in new warehouses that have been well insulated for the colder months. 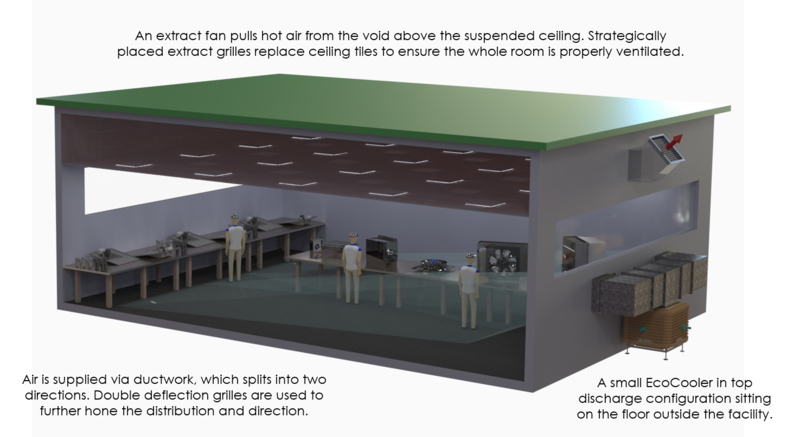 EcoCooling evaporative coolers can offer a balanced ventilation scheme which can ensure full compliance and can operate using just 10% of the cost of traditional air conditioning. EcoCooling systems are typically only 60% of the capital costs of air conditioning and 10% of the running costs. 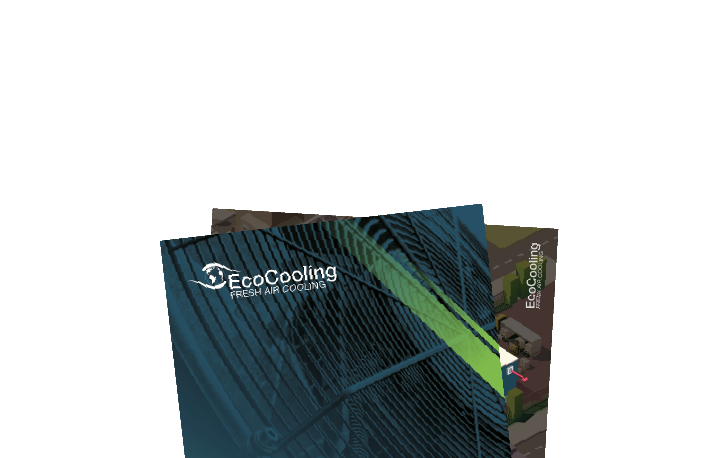 EcoCoolers are the industry leaders in energy efficient cooling, making them perfect environmentally friendly solution for any large building. In fact, EcoCoolers are 90% MORE efficient than any traditional refrigerant-based air conditioning unit. They also only use 100% fresh air, require minimum maintenance and are safe and easy to operate. EcoCooling have been operating for over 15 years in the industry and have vast experience in implementing cost saving solutions to many warehouses. Our team can work to meet any specification and our system can save you as much as 90% on your cooling costs. We pride ourselves on offering affordable cooling solutions so contact us today to talk through your project. 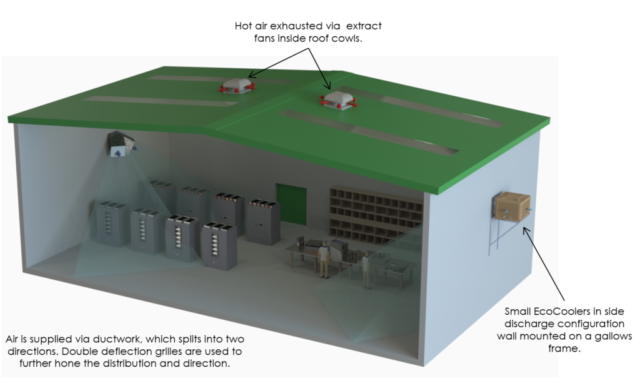 EcoCoole rs are used as part of a mechanical ventilation system to provide a cost effective alternative to refrigeration for large buildings. 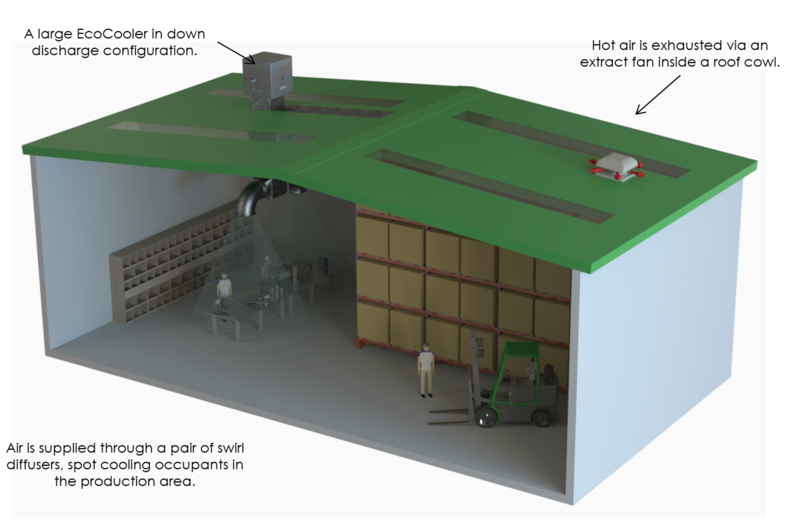 Evaporative coolers have a supply air temperature dependent upon the ambient temperature and humidity. On cool days this is the ambient (dry bulb temperature) and on hot days, when evaporative cooling is enabled, this is close to the ‘wet bulb’ temperature.